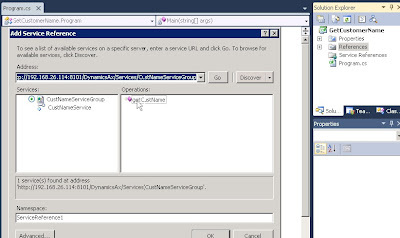 As promised, in this post we’ll see how to create a simple demo service using AX 2012. Please refer to my last post about AX 2012 Service Documents Types and A Simple Introduction to AX 2012 Services Architecture to get a more detailed explanation to AX 2012 Services. Also, I would like to point out that AX 2012 services are hosted on the AOS, and that both internal and external applications will be authenticated through the AOS. With this being said, the following example will be an internal application that will get the customer name from AX services. If I wanted to have an external application executing the same operation I would have to host the services in IIS. For more information on services please refer to this white paper. Further, when working with AX 2012 WCF services, we will have to dive into data contracts. In this sample service will use a DataContractAttribute. The string DataContractAttribute indicates that this class is a Data Contract. The square brackets  indicate that this string is an attribute. We are also going to be using Data Members, which would help us define the default values for our data contracts. If you are new to this, don’t worry, you can find a lot of information about Data Contracts and Data Members out there. Another concept that we’ll be exposed on this example is the SysEntryPointAttribute, which helps with authorization checks and how they are performed for a method that is called on the server. 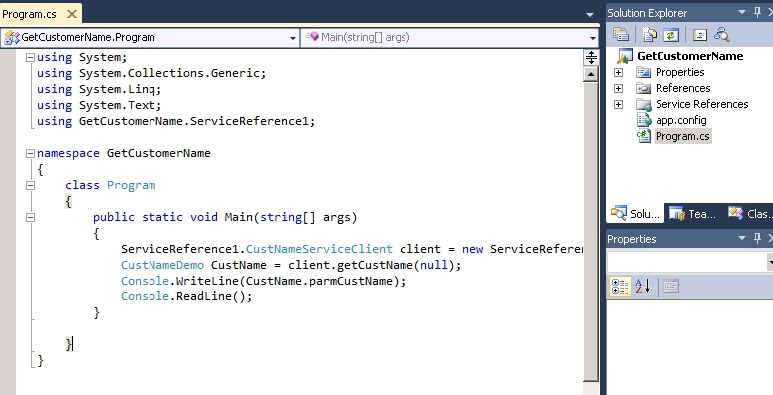 Further, this is a very important class when working with Services in AX 2012 as we have to use it for all service operations. 2. Create a new class. 3. Enhance the class by adding the [DataContractAttribute] attribute. 4. Create a new method. 5. Enhance the class by adding the [DataMemberAttribute] attribute. 7. Create a method that instantiates the class created in Step 2. 8. Enhance the class that uses the [SysEntryPointAttribute] attribute. 9. Right-click the Services node in the AOT and select New Service. 10. Enter a name into the Name property. 11. Set the Class property to the class created in Step 6. 12. Expand the new service node. 13. Right-click the Operations node and select Add Operations. 14. 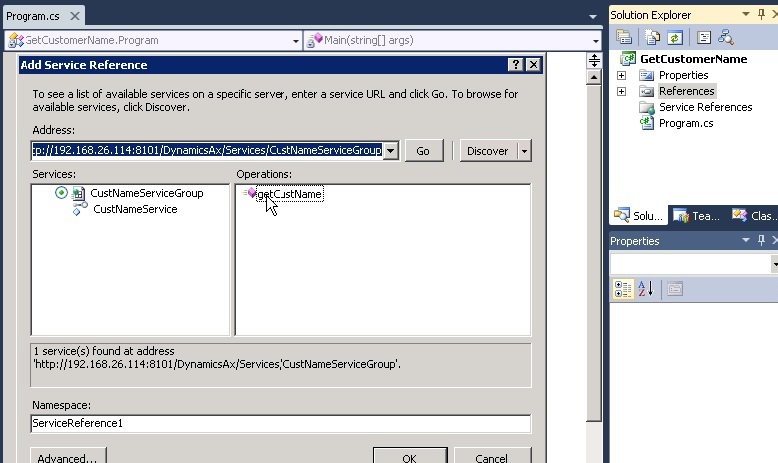 Right-click the Services Group node in the AOT and select New Service Group. 15. Enter a name into the Name property. 16. Drag-and-drop the service created in step 9 under the Service Group node. 17. Right-click the service group and select Deploy service group. Ok, so at this point we should have our new AX 2012 service already working. 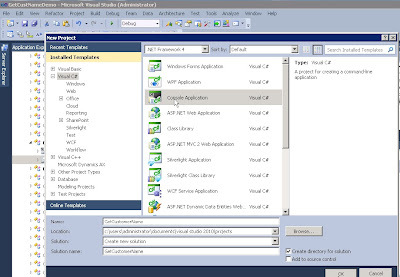 The next step is to learn how to use this service from Visual Studio 2010. 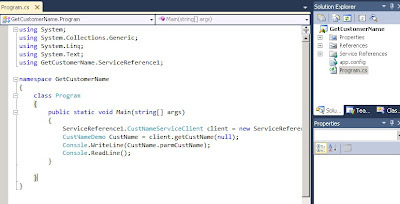 Please refer to this article if you are new to adding services references to Visual Studio. It will help you understand the underlying concepts of this operation. 1. Select File > New > Project to create a new project of type Console Application. 2. Enter a name into the Name field and then click OK.
3. Right-click the Service reference node under the project. 4. Select Add Service Reference. 5. Enter the address and then click GO. 6. Select the service and then click OK. NOTE: The address format in step 5 is http://<machinename>:8101/DynamicsAx/Services/Xpp. 7. Invoke the service from the client. 8. Click F5 to run the service. As you can see, when you run the service, the first customer name that are available in your system will be presented as an output. There is a lot more to services and you can start learning more about it by going to partner source and/or downloading the new AX 2012 white papers focusing on services. I will be posting a lot more on this later soon, so keep reading my blog as there is a lot more to come. I am quiet new to the AX world. I have a job in hand to integrate sales order from Dynamic CRM 2011 to AX 2012. Can you give me your valuable inputs please like where should i start from or any steps that is should follow. Thanks Mate for sharing your knowledge. It is fairly simple. AX 2012 has the capability to integrate with CRM. I have already tried the connector. It has plenty of limitations and restrictions in CRM after integration. Lately i have been checking out webservices that are availaible in AX through AIF. I did notice there is CustFreeTextInvoice service availaible but i am not sure how can i use it C#. You can please throw some light on it. but it was not much of help. For now i am only looking out to move invoices from CRM to AX as free text invoice without the using Excel Addin. Anyway, for that specific requirement, look at the course 80416 is partner source or customer source (https://mbs.microsoft.com/partnersource/communities/training/trainingmaterials/student). There is an example there to get what you need. For some reasons I thought your name is John. I do have access to partner source but dont have access to that particular course. So is it anywhere possible for you to copy paste the example from there to here or email me Please.